I only got to know of the “Ian Bell run-out incident” itself when I got onto the Cricinfo mobile site. Yes, the incident is unfortunate and did bring back memories of a match in 2006, when Baz McCullum took off the bails when Murali completed his run and then went to congratulate his batting partner, Sangakkara, on having reached his century. He failed to notice that the ball hadn’t been returned back to Baz. Everyone appealed and it was given out and Fleming didn’t bother revoking his decision to appeal. That dismissal cost us a fair bit as Murali was providing good support to Sanga,who would’ve stretched our lead further to ensure that the Lankan bowlers had more to bowl to in the final innings of the match. It was the same here, except that Bell had packed in his gloves to go have his hot cuppa tea. However, this incident was worse because there was the clear egging by Morgan, who has always displayed himself as a very street-smart player, to get back to his crease, all of which went unheeded by Bell. The umpires asked Dhoni whether he wanted to keep the appeal on, to which he replied in the affirmative. 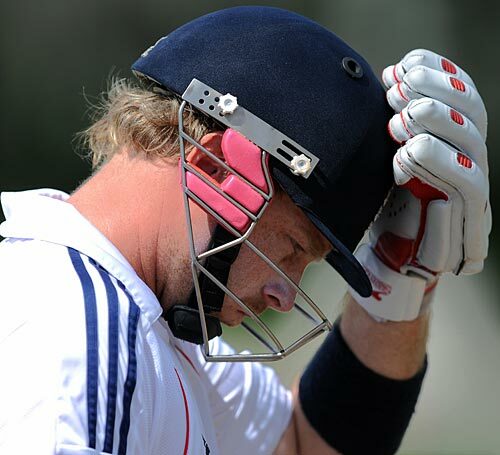 However, what makes this whole “recalling Ian Bell” incident farficial is this. Strauss and the coach, Andy Flower, had the nerve to go and ask Dhoni whether he wanted to keep the appeal as such. Did they really have to be a pair of babies to go and ask Dhoni to return the toys which he stole from them? Naturally, Dhoni wouldn’t have wanted to be cowered by the demand made by the two, so he said that he wanted to discuss it with the team. The booing by the crowds, as well as the possible negative opinions which may have been formed of him (as if bad publicity about the preparation for the tour wasn’t hard enough to handle), would’ve persuaded him to overturn his appeal. Besides, how bad would it look if, despite a personal appeal, he didn’t revoke his decision? People might even go to the extent of misconstruing it as disrespect for the two Andys. Therefore, enough with the praises from the ECB and the ICC about how “the spirit of cricket was upheld by the two teams”. There was much more at stake for both teams than the Spirit of Cricket (it eventually proved to be less for England as Bell added a further 22 runs before actually getting out), so they decided to revoke it. I don’t think no-one’s conscience felt the pinch! So, get over it, everyone, and focus on the great batting display being provided by the Englishmen! To select or not to select Ramps, that is the question! Ah, the thought of seeing Ramps gracing the stage for one final shot at redemption just fills my heart up with joy! Yes, I have to make a confession here. I am a true romantic, one of those many people like The Times’ John Woodcock, Wisden Editor Scyld Berry and many more. Though I was a huge supporter of England during their home series against India in 2007, I kept egging on Anil Kumble to get his maiden Test century in the last test. I didn’t have cable at that time, so the only way that I could really follow the match live was through the BBC Test Match Special commentary. I literally jumped off my chair and was punching the air when the commentator said that Kumble got his century. That just increased my desire to see Ramps for one last time on the international stage. However, there is a realist lurking within me who keeps saying “That guy is mentally frail, can’t really rise to the ocassion”. Though the romantic in me tries to diss him, he does realise that it’s true, and there are a number of reasons. The first is the fact that, for most of his career, he has been playing in the second Division of the County Championship where, as many will know, the standard of bowling is not the very best in the country. A good example is Philip Hughes. He had entered the Ashes with a reputation as big as the Beatles and has now been kicked into a corner by the selectors. He did make quite a lot of runs (averaging more than 100 in 5 or so matches, if I’m not mistaken) in the County Championship, as well as in the FP trophy matches but was found wanting against international-level bowlers. Another point that the realist makes is that Ramps did go about 4 – 6 matches without a century when he was on 99 first-class centuries as the spotlight was firmly on him (due to the fact that he could possibly be the last member of this ‘club’). However, after he finally got the 100th hundred, he continued his run-spree, showing that pressure still does get to his head. As I write this, first BBC and then Cricinfo say that Jonathan Trott is more likely to replace Bopara, while Bell (who’s going to make his Test Debut for the 49th time) will be pushed up to No.3, a position in which he has been an utter failure. So there goes mine and many other people’s hopes (including that of Alec Stewart and Chris Adams) of Ramps getting a final sojourn, but it was all fun while it lasted! Aussies sending spies to disrupt England Cricket! All in English cricket, beware! Cricket Australia (CA) has sent spies to disrupt English preparations ahead of the ‘all-important’ Ashes season. The spies, coming under the names ‘Claydon’ and ‘Thorp’ have knocked out the first 5 wickets of the MCC team, including the England hopefuls Vaughan, Key and Bell. All is gloom and doom for the Poms! The fate of the England team…..
….is just like a soap opera! Interim coach Andy Flower says that there’s nothing to worry about. Once in a while, an abject defeat takes place…. I suppose it’s the timing of the defeat that has got so many conspiracy theories running amok. The ‘KP-Moores’ fiasco, along with the auction of the IPL, has got conspiracy theories being thrown about like money to a bunch of beggars. For one thing, though people always claim the Indian media to be like a swooping vulture, the English media is no different. I still remember reading an article about the legendary Windies spinner Sonny Ramadin. His actual name was ‘KT Ramadin’. However, Ramadin didn’t know what his initials meant and, since his teachers used to call him ‘son’, he just adopted the name ‘sonny’. However, the English media, when he toured England with WI, relentlessely kept bugging him about what KT stood for! I don’t think England have too much to worry, except that some heads should be sent rolling (casts a glance towards Ian “I didnt scratch Owais’ eye” Bell)! As for WI, it’s was just heartening to hear about the victory. I still remember the days (roughly about 15 years ago) when a match against WI would be deemed ‘by default’ to be a victory for them. Their fall from grace has been hard to watch, and i sincerely hope that they keep going up! Nice to see a level playing field. As for my predictions for this series, its 2-1 in favour of WI! Teflon King lives another day! Having no claim than being a ‘classy player’, the Teflon King, Ian Bell, manages to sneak in the side after Owais Shah made a big claim for his spot with an unbeaten 125 against the St. Kitts & Nevis Invitational XI. Harmison has been brought in, in the hope that he might recapture the glory of 5 years ago (7/12 in an innings in the very same Sabina Park), and SiBo comes back after a very long break from cricket because of a bad back. Great bloke, he is!